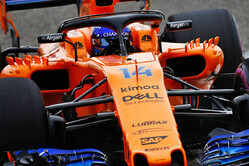 Despite failing to get either car through to Q2, and at a time of increasing media pressure, Fernando Alonso has leapt to McLaren's defence. Asked if the team was losing way, the Spaniard replied: "It depends... the results on Sunday we are happy and optimistic about with some good performance but on Saturday after qualifying I am always here in this ring answering negative questions because our average position this year is P13, so the level of competitiveness is not at the level that we want. "In Canada we were P15 in Q1 and we were on the borderline already two weeks ago so it is no big surprise," he continued, "and it is definitely disappointing and we need to keep working, but nevertheless in the past seven races we were in the points at every single race apart from the races where we had technical issues. I think tomorrow we still have a chance. "On the personal side I'm trying to do everything possible," he added. "I believe I'm the only one right now who is 8-0 against the champion in GP2 and all the categories he raced in," he said, referring to the fact that he is the only driver to have out-qualified his teammate on every occasion this season. "This is Formula One. You need the right package and the right place. These last races have not been good for us but amid all this disaster I am seventh in the drivers' championship, so we must be doing something right." Asked what he expects from today's race the Spaniard, who has been a vocal critic of the direction the sport is heading, and the continued dominance of the big three, was as blunt as ever. "The same as in the last few races," he replied... "a train of cars all Sunday. "Those on pole will be fastest," he added, "they will start first and run away. The second ones will start second and run away. The third ones will start third and will run away... the weather could play the most important part. If it rains like this morning or if there's changing conditions it will probably be a more chaotic race. If it doesn't rain, it will be more complicated to overtake." Check out our Saturday gallery from Paul Ricard, here. McLaren: Whitmarsh comments "ill-judged" and "ill-informed"
"in the land of the blind, the one-eyed man is king"